Boxing, if taken from its earliest days in all its shapes and forms, is probably the richest and most diverse sport of all, full of goldmines and gold nuggets, a glorious and unruly slab of history with countless different offshoots and mysterious little alleys. Just as eager astronomers continue to discover new galaxies and new planets, so we continue to mine the lost and hidden treasures of our own little kingdom and unearth new jewels. Somebody discovers another Jack Dempsey fight that has been buried in the mists of time. Somebody else comes up with a fresh story about a famous fight that we thought we already knew everything about. Where fighters of a bygone age are concerned, especially those who are only able to show us their great talents on snatches of old and grainy film, we can only study form and reach what we believe to be a fair summation of their historical standing. Then we stumble across something that causes us to rethink. Just recently, I was reading an old book by Denzil Batchelor, a popular and respected British boxing reporter of the forties and fifties, and came upon his opinions of the featherweights who reigned before the Great War. Up came the name of Johnny Kilbane, the Irish wonder from Cleveland, Ohio. Ah-hah, I thought, this should be interesting. Why? Because I have always had a little trouble getting a real handle on Mr Kilbane. Such was Johnny’s cleverness that so often in his career he would coast and clown and only do as much as he had to do to win. Judging such fighters is always something of a headache, since one can only give them so much leeway in regard to how much greater they MIGHT have been if they had really stepped on the gas. I remain convinced that the three greatest featherweights, all factors considered, were Jem Driscoll, Willie Pep and Henry Armstrong, and I really don’t have much of a problem about the order in which those three geniuses are placed. But where does Johnny Kilbane fit in what we might call the second tier? Was he better than Attell, McGovern, Johnny Dundee, Kid Chocolate, Vicente Saldivar or Alexis Arguello? Denzil Batchelor wrote his book in 1954, which of course was well before the times of messrs. Saldivar and Arguello, but the author’s estimation of Johnny Kilbane still surprised me. Here is a paraphrased version what Batchelor said: “The greatest of American feathers before the Kaiser’s war was unquestionably the brilliant Johnny Kilbane, who defeated Abe Attell in 20 rounds in 1912 and held the title for eleven years till beaten by Eugene Criqui. It is here that we run into the usual wall of frustration, since we will never know whether Johnny Kilbane was truly one of the supreme talents of his weight class. But here is something else that gave me a jolt. When you trawl back through Johnny’s achievements by way of countless newspaper reports, there is a recurring theme of unstinting praise for his ring skills. Hard-nosed, genuine boxing writers, well seasoned and not inclined to purple prose, clearly struggle to find the appropriate superlatives for the Fighting Mick of the featherweights. On more than one occasion Kilbane is described as the ace of all fighters, which is praise indeed when one considers that his long reign as champion bridged the eras of Jack Johnson and Jack Dempsey. Abe Attell, the wonderful Little Hebrew, was the so-called dancing master, fast and crafty as a fox, tough and courageous. Only Peerless Jem Driscoll had truly mastered Attell in the pure boxing stakes, trimming Abe very neatly in their classic New York encounter of 1909. Abe had seen off all other challengers and it seemed that he might just chug on forever. Then he defended his championship against the young and devilishly evasive Johnny Kilbane and must have thought that Driscoll had come a-haunting in a different guise. Johnny didn’t just take Abe’s title. He absolutely cleaned him, and referee Charles Eyton had no hesitation in raising the challenger’s hand at the finish. Attell couldn’t believe his defeat and certainly could never accept it. The veteran and the new kid on the block clashed over 20 rounds at the Vernon Arena in California on February 22, 1912. Nearly ten thousand fans crammed into the venue, where the capacity was 8,400. A further five thousand failed to get past the gates and were turned away. The gate receipts totalled around $25,000, a formidable total at that time. Johnny and Abe fought for a $10,000 purse, of which it was agreed that Attell would receive $6,500 irrespective of the result. The fight was filmed and the boys also agreed on an even split of the motion picture privilege. For Abe, the result was a stunning reversal. The skill and guile that had seen him reign for years was sadly infrequent against Kilbane, suppressed by Johnny’s speed and cleverness and by Attell’s ageing legs. Abe was very nearly shut out of the fight, one ringside reporter only according him the seventh round. Attell never got out of the starting blocks and then he began to panic as his prized crown began to slip from his grasp. Desperation gripped him as the battle wore on and his efforts to turn the tide failed. He resorted to fouling, a tactic that didn’t go down at all well with his supporters. He locked Kilbane’s arms in the clinches, heeled him on one occasion and tried to bend his left arm back on another. If Abe believed his fans would turn a blind eye to his actions, he was mistaken. Boos and hisses filled the air as the old campaigner worked his way through his box of dirty tricks. Attell had plenty to feel angry about. The erstwhile boxing master was being repeatedly struck by a relentless flow of accurate punches from the young Irish upstart. In the sixteenth round, with no great attempt to mask his intentions, Abe surged into a clinch and butted Kilbane so severely that Johnny sustained a deep gash over his left eye. Blood oozed from the ugly wound but the inconvenience failed to check Johnny’s inexorable march to the championship. Abe’s mood had already worsened at the beginning of the round, after referee Eyton had grabbed a towel and wiped a liberal coating of grease off the champion’s body. Abe and his handlers, it seemed, were trying an alternative way to slip punches. But Johnny Kilbane was the big story on this day, even if the great Attell was finally slipping over the hill. Even Johnny’s backers marvelled at the authoritative manner in which their man put Abe under the cosh and never let him up for air. The youngster was incredibly fast with his hands and feet and couldn’t seem to miss Attell with a persistent stream of solid, straight jabs. Right crosses repeatedly hit the champion with speed and force. Such was the quality of Kilbane’s footwork that even the usually graceful Attell was often made to look crude and ungainly. From the outset to the finish, wise old Abe laid traps that yielded no prize. He tried to feint Johnny, he tried to corner him, but the young ace avoided all the potential pitfalls with the untouchable air of a ghost. The decision for Kilbane was a popular one and greeted enthusiastically. Johnny was carried from the building on the shoulders of his friends, telling them that he wanted to telephone his wife. Attell left the ring on his own, no longer the world champion, no longer the man everyone wants to talk to. Spotting a friend, Abe said, “Well, I had to stand for it. I couldn’t do any better.” It seemed a philosophical acceptance of the inevitable on Attell’s part, yet his dethronement – and Johnny Kilbane personally – would rankle with Abe for the rest of his life and fill him with bitterness. But that wasn’t all. It was also Abe’s contention that Kilbane had tried to poison him by way of the fumes from the chloroform that Johnny’s handlers had apparently rubbed into his body. Forty years later, Attell was still raging when he bumped into Kilbane at Madison Square Garden. It wasn’t your average social reunion. “I’d like to punch you in the nose right now,” Abe said. Kilbane apparently laughed and left it at that. According to boxing writer JP Garvey, Johnny Kilbane had jammed 43 fights into just three-and-a-half years’ campaigning by the time he dethroned Abe Attell. 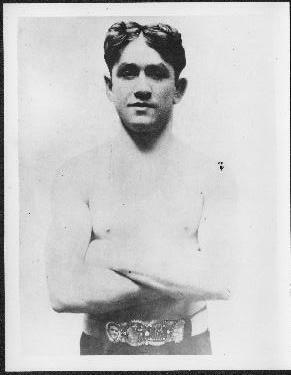 Garvey was impressed by the new star of the featherweights and wrote, “Johnny Kilbane, as Irish as Paddy’s pig, a 22-year old boy with sparkling eyes, ready wit, whose every action is peppery, effervescent, indicative of a lightning brain and panther body, is the successor of Abe Attell as the featherweight champion of America. A boy better equipped for this estimable honour would be hard to find. From his teens, Johnny Kilbane was a tough little customer. He simply had to be. His father went blind and Johnny was hurried through school so that he could go out to work and support his family. He was around thirteen or fourteen when he got a job as a switch tender on the New York P&O railroad. He weighed little over 90 pounds but quickly became known as a live wire who loved to fight. Johnny spent his evenings hanging out with boxing fans at the appropriate watering holes and loved to listen to them discussing the fights. The young Kilbane soon began to fantasise about a career as a professional fighter, imagining glorious victories and the cheers of big crowds. Switch tending on the railroad paid a steady wage but it wasn’t the way to spend the rest of your life. Johnny quit after a year. The boxing bug had bitten him hard. Jimmy Dunn, a crack lightweight of the time whom Kilbane idolised, was training at Crystal Beach and Johnny went to watch him. He and Dunn became good friends and Dunn willingly gave Kilbane boxing lessons, later becoming Johnny’s manager. Kilbane fought his first professional fight on December 2, 1907, and had no trouble getting matches for the first six months of his career. But a lean period followed, during which time Johnny often found it hard to get three square meals a day. The tough times failed to dampen his enthusiasm. He studied the Noble Art all the time, eager to learn more and improve his toughness and technique. His natural love and talent for boxing made him a quick learner. The first big year for Johnny was in 1909, when ring work became plentiful again and he started mixing with quality fighters such as Jack White, Johnny Whittaker, Biz Mackey and Happy Davis. Kilbane’s style was a double-edged sword that drew its share of critics. His great skill and speed, not to mention his general ring cleverness, became universally acknowledged, but even his friends felt that he was too much of a ‘runner’. Kilbane proved that he could knock opponents out as well as out-fox them over the long haul, but he failed to shake the conviction of many that he was, in the parlance of the day, a ‘looking glass’ boxer. Johnny’s cause wasn’t helped by the presence of another ‘Kilbane’ on the boxing scene. The undefeated Tommy Kilbane, also out of Cleveland, was much more of a fan’s favourite with his aggressive, hard-hitting style. He and Johnny had already clashed three times , with Johnny holding the advantage in their closely contested series. The two boys decided to settle the question of supremacy and it was Johnny who won the day by a decision when they battled at Canton, Ohio, on New Year’s Day in 1910. Nevertheless, Kilbane continued to be a ‘grey’ fighter to many fistic observers. Very skillful, yes. World class, undoubtedly. But could the kid marry all that fancy stuff to a knockout wallop against a top notch opponent? The fight that caused many of Kilbane’s critics to revise their opinion of him was his smashing triumph over Mexican Joe Rivers at Vernon, California, on September 4, 1911. Rivers had already taken a 20-rounds decision off Kilbane in their first fight four months earlier, a defeat that hurt Johnny. He took a great pride in being one of the ‘Fighting Irish’ and felt he had let his side down. In the early rounds of their return match, Mexican Joe, a powerful and natural fighter, again proved to be a tough proposition. A fast and often furious puncher, Rivers had little trouble in tagging the speedy and elusive Kilbane. The stinging blows that struck Johnny only served to harden his resolve as he turned hunter and waited for the chance to outpunch the puncher. The end came with shocking suddenness in the sixteenth round, when he drilled a tremendous right to Mexican Joe’s chin and knocked him out. By 1921, Johnny Kilbane had been the featherweight champion for nine years, having mastered the division in much the same dominant fashion as Abe Attell had done before him. Johnny had now won the respect of fans and writers everywhere and was approaching near legendary status. He had become almost a part-time fighter, devoting much of his time to buying and selling real estate. But the cartoonists still loved to remind people that this was the phantom with a punch who had made Abe Attell look foolish. Abe’s caricature would invariably be seen swiping furiously at thin air, and how that must have hurt the Little Hebrew. But Kilbane was now fading and losing his desire for ring warfare. Ace writer Bob Edgren had seen the hunger slowly go out of 31-year old Johnny, so much so that the champion was able to turn down an offer of $30,000 from Tex Rickard to fight any challenger of choice. Wrote a somewhat disenchanted Edgren: “I have no trouble remembering the time when Johnny would have been glad to fight any featherweight in the world for fifteen hundred or for the fun of it. If Kilbane was Kilbane, he’d do it now. “Johnny may be fair, fat and thirty-one today, but he was the genius and original ‘Fighting Mick’ when he beat Abe Attell. Surest thing you know, that boy could fight anything from a Mexican wildcat to a grizzly bear and get away with it. He had a poke like a lightning bolt and a sidestep that made his opponents miss more swings than there are on all the gates in the county. Talk about a dancing fool! That was Johnny Kilbane when he felt like dancing. He could hop, skip and jump around a ring in a way that would make Johnny Dundee look like a loaded truck trying to go up Fort Lee Hill on an icy morning. Edgren was not wrong. It was a recurring theme of Johnny’s career to remind people with a jolt of his ability to seek and destroy when he needed to. A good way into his featherweight reign, Kilbane was moving along nicely and outpointing challengers without fuss or frills. The fans were getting a little bored with the safety-first champ. Then a man known as the Knockout King made the mistake of upsetting Kilbane. George (KO) Chaney, as hard a pound-for-pound puncher as there ever was, secured a crack at Johnny’s title after Chaney’s manager had baited Johnny in the sports pages for quite some time. Kilbane was true to his word. He gave George (KO) Chaney two rounds to show his wares and then knocked out the Baltimore challenger with a single shot in the third. But Johnny boxed on, of course, as most great champions invariably do until they receive that final and irrefutable confirmation that the well has run dry. Some two years before French war hero Eugene Criqui ended Kilbane’s astonishing reign, Johnny painted his last masterpiece in Cleveland. There, on September 17, 1921, he gave another stirring example of how he could turn off the smiles and turn on the power. Danny Frush, despite a brave and courageous challenge, had already been decked twice by the time he came out for the seventh round to take another Kilbane fusillade. The two fighters rushed to the centre of the ring and Johnny landed a left to the face. Frush then went down for a third time from a left to the jaw, getting up slowly at the count of nine. He was quickly down again from a succession of lefts and rights to the jaw and now in disarray from being hit and generally bedazzled. Unsteady, Danny swayed into the ropes and received terrific punishment from further rights and lefts to the face. He fell from the ropes to the canvas, where he remained as the referee counted him out. Oh yes, Johnny Kilbane could dance alright. He could also kick like a mule when the mood took him.